Ken Davis is an award-winning sports writer who has covered college basketball for 35 years. He grew up watching Jayhawks basketball in Overland Park, Kansas, and graduated from the KU William Allen White School of Journalism in 1980. After 25 years in the newspaper industry, Davis has been a freelance writer and national college basketball writer for NBCSports.com and FoxSports.com. This is his third book on college basketball. Davis was inducted into the New England Basketball Hall of Fame in 2013. He lives in Coventry, Connecticut, with his wife, Nancy. They have two sons, Patrick and Joseph. Ken Davis, author of 100 Things Kansas Fans Should Know & Do Before They Die, interviews live on "The Big E Sports Show" on Yahoo! Sports Radio. Ken Davis, author of 100 Things Kansas Fans Should Know & Do Before They Die, was interviewed on "Sportsline with Tony Caridi" on MetroNews Radio Network. 100 Things Kansas Fans Should Know & Do Before They Die was reviewed on Rock Chalk Talk, an SB Nation blog. 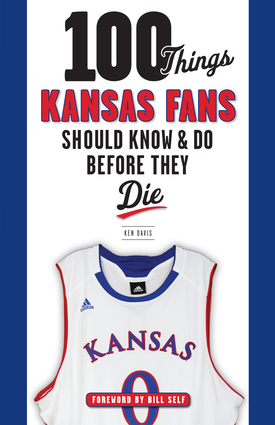 They say, "So whether reading the book will open your eyes to a history you hardly knew, or let's you relive all the ups and downs of your Jayhawk-filled life, or a little of both, I highly recommend you give 100 Things Kansas Fans Should Know & Do Before They Die." Ken Davis, author of 100 Things Kansas Fans Should Know & Do Before They Die, interviews live on "Total Education Network" on Blog Talk Radio. Ken Davis, author of 100 Things Kansas Fans Should Know & Do Before They Die, interviews live on "SportsDay" on KVGB. Ken Davis, author of 100 Things Kansas Fans Should Know & Do Before They Die, interviews live on "The Marty Mutti Show" on KSOK. Ken Davis, author of 100 Things Kansas Fans Should Know & Do Before They Die, interviews live on "Rock Chalk Sports Talk" on KLWN. Ken Davis, author of 100 Things Kansas Fans Should Know & Do Before They Die, was interviewed on "The Night Shift" on KCSP (Kansas City, MO). 100 Things Kansas Fans Should Know & Do Before They Die was featured in an event listing in the Lawrence Journal-World. Most Kansas fans have attended a game at Allen Fieldhouse, chanted "Rock Chalk Jayhawk" and joined in the festivities at Late Night, but only real fans know the new lyrics to "I'm A Jayhawk," have felt bittersweet pride (and maybe shed a tear or two) during the speeches and celebrations on Senior Day and road tripped to Manhattan, Kansas to watch the Sunflower Showdown from a different angle. •	Details of game-changing plays and exciting wins including national championship titles from 1922, 1923, 1952, 1988 and 2008. Whether you're a die-hard fan from the days of Larry Brown and Danny Manning or a newer supporter of Bill Self and Andrew Wiggins, 100 Things Kansas Fans Should Know & Do Before They Die offers a chance to know the most important facts and figures about the team, the traditions and what being a Kansas fan is all about. Ken Davis is an award-winning sports writer who has covered college basketball for 35 years. He grew up watching Jayhawk basketball in Overland Park, Kan., and graduated from the KU William Allen White School of Journalism in 1980. After 25 years in the newspaper industry, Davis has been a freelance writer and national college basketball writer for NBCSports.com and FoxSports.com. He is the author of The University of Kansas Basketball Vault and The University of Connecticut Basketball Vault. Davis was inducted into the New England Basketball Hall of Fame in 2013. He lives in Coventry, Connecticut.